When you want to obtain a list of all the registered objects of a specific type, you can use the ResolveAll method. The two overloads of this method accept either an interface or a type name, and they return an instance of IEnumerable that contains references to all registered objects of that type that are not default mappings. The list returned by the ResolveAll method contains only named instance registrations. 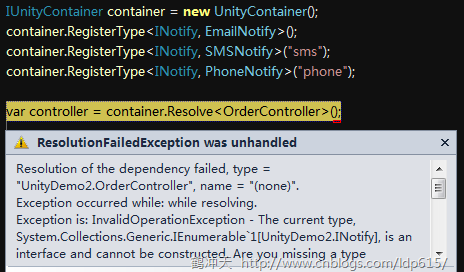 Implementations of this interface should delegate to the underlying dependency injection container to provide the registered service for the requested type. When there are no registered services of the requested type, the ASP.NET MVC framework expects implementations of this interface to return null from GetService and to return an empty collection from GetServices. For more information about IDependencyResolver, see the entry ASP.NET MVC 3 Service Location on Brad Wilson's blog. The code I posted above does not work well for ResolveAll as Unity does not behave as expected. Maybe I should have unit tested before posting :). Ninject maybe a better choice after all.